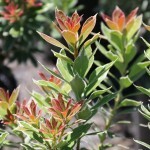 A rounded, compact shrub with a thin white edge on the dark green leaves. New growth is pinkish-red. The early spring flowers are white. Prefers acidic, well-drained soil and part shade. 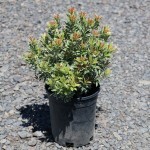 Great for a tight space that needs some brightening up, in a container, or in a rock garden.